This former church will be saved as a heritage building while the property is developed for residential purposes. A heritage church building in the centre of Vancouver will be saved even as the property it sits has been approved for redevelopment. The building had been used by several congregations – Baptist, United and even Rosicrucian – before being left vacant in 2010. Members of a neighbourhood resident’s group have opposed the project, saying the proposed density of housing is not in keeping with the community. The project will feature three four-bedroom and one two-bedroom homes, plus one four-bedroom and one two-bedroom infill coach houses in the lane. The homes include lock-off units that could be used as rentals. Douglas Park United Church was designated as a Heritage Building. 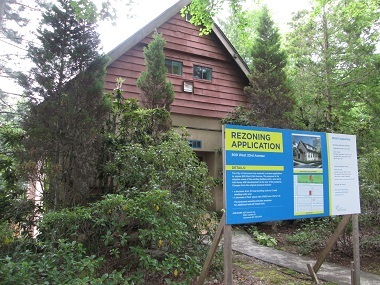 It will be retained and added to the Heritage Register. There aren’t too many church buildings around that I don’t know about (having kept an eye on them since the 1980s), but I found one this week. Admittedly, it’s been pretty well disguised, but it’s an interesting case. Very interesting article and sad to see all these historical buildings lost. I am currently involved with trying to save the original Douglas Park United Church (1927). It later transferred to the local Baptist congregation in 1939 which stayed until 1952 when it transferred to Rosicrucians. The building was offered for sale last year and unfortunately no faith group came forward so I have contracted to purchase it and restore the original exterior and convert to townhouses. Although it will not be available for community space, the building will be preserved and honoured for the community. There were a lot of green ‘Take a Stand’ t-shirts at the open house. I wish Phillips well. 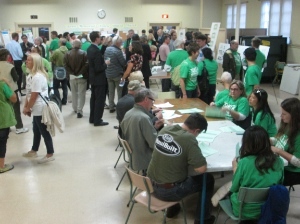 Green-shirted neighbours were out in force to oppose the project at an open house September 29 at Chown Memorial and Chinese United Church. 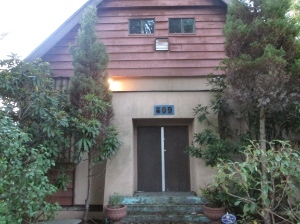 The church is at 19th Avenue and Cambie Street, just a few blocks northwest of the property under scrutiny, which is at 809 West 23rd Avenue (at Willow Street), south of Douglas Park. We are a community of residents working together to maintain the quality of life in the beautiful Douglas Park neighbourhood, by safeguarding against the erosion of its special character and RS-5 residential integrity through incongruous development and over-densification. The old church building at 809 East 23rd Avenue. 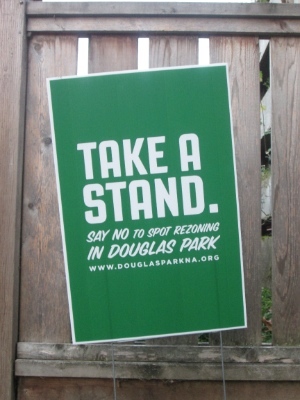 They are opposed to “spot rezoning” at 23rd and Willow, or anywhere else in the Douglas Park area. EDG Homes Inc. plans to reuse and extend the former house of worship at 809 West 23rd Avenue for six strata-titled homes, four of which will have basement units for rental. Heritage consultant Donald Luxton is working with the developer to convert the structure, built in 1927 as the home of the Oak Street United Church. . . . This ‘Take a Stand’ sign is kitty corner to the property in question. The planned redevelopment of the former West 23rd Avenue place of worship is a heritage project that will restore its original appearance. “The building doesn’t look like much right now, so I know people have questioned why you would do this as a heritage project,” Luxton said. “But I think once you see the plan, you get a sense that we’re returning it back to a much more appropriate appearance on the exterior that reflects its original design intention.” . . .
“There’s a trend that has been happening that church buildings are coming up for other uses, and this one hasn’t really been used as a United Church in a very, very long time,” Luxton told the Georgia Straight in a phone interview. Paul Phillips of EDG Homes Inc. is hoping to restore the former church building. 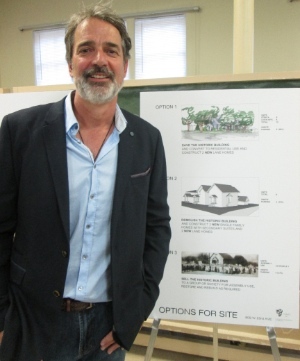 Phillips is keen to see his project succeed, noting that it would be a more creative use of the land than simply tearing the old church building down and plunking two new houses on two 33 foot lots. He says there is no reason, in theory, that the building could not again be used as a church – and he would even be willing to consider selling to a church under the right circumstances. He believes the original church usage should allow any purchaser to avoid the kind of parking requirements that the city requires of churches when they seek to use a property for a new purpose. However, city officials at the open house were dubious about that. As well, one can only imagine how many green-shirted neighbours would turn out to oppose any such novelty, even if it were really a return to the property’s original purpose.